There was a time that Jesus was dead. Yes, there was resurrection, but today can we sit in that spot before that resurrection, for just a moment? Can we sit with his disciples? They were almost certainly more than that – they were his friends. They had left their regular lives to spend time with this man. They believed his message. They trusted his words. They ate with him, they walked with him, they ministered with him. For the better part of 3 years, their lives were intertwined with Jesus’s. They had the grief that comes with losing a close friend. They knew that he had spoken of life after death, but how could they know that it meant resurrection? How could they know that he had the power to raise himself from the dead? How could they know that they would ever get to share a meal with him or laugh with him or argue with him again? How could they relish in the “some day” reunion with him when right now they were feeling the ache of loss? And there was the manner of his death – executed in the public square for the very declarations that they had followed. Jesus was whipped, mocked, and crucified for saying that he was the son of God. They had believed the same. They had said the same. Mixed with their grief was a sense of terror – what if they were next? Can we sit with Judas? One of the original twelve, but at the end, he was disappointed. Jesus wasn’t turning out to be who he thought he was supposed to be, who he had been told the Messiah would look like. He stayed with him, so clearly there was a closeness in that relationship, but Judas could see the turning of the tide, and he wanted to get out ahead of the pain that was about to be poured out on the people who were followers of Jesus. He had information, so he used it. But then it wasn’t a long trial. Jesus wasn’t merely beaten and humiliated, he was crucified. His friend, his mentor, his teacher – the man he had devoted his life to for years was utterly destroyed. Sure, he was probably in the clear because he had been the one to give him up, but the devastation of that act ate at him until he could bear it no longer and he took his own life. Grief mixed with guilt and shame caused him to forget all that he had heard about love and forgiveness. Can we sit with Mary, his mother? Just a child herself when she conceived, Mary had raised a boy who became a man and claimed to be God’s own son. And because of the events surrounding his birth, she believed it. But that didn’t stop her from remembering the times that she had nursed him, had held him in her arms, had comforted him when he had experienced pain, both physical and emotional. His deity hadn’t stopped her from thinking of him as her son. Despite all she had done to protect him, he had still been captured, tortured, and murdered. She watched his back be torn open. She had watched him struggle to carry his cross up to the hill of the skull. She had watched the nails gouge into his wrists and feet. She had watched him struggle to breathe and then she watched him die. Can we sit with the brokenhearted today? People who have heard the Easter story so many times that it has lost all meaning. What does resurrection look like in the face of loss and mourning? What does the promise of eternity look like when you are dealing with the daily ache of missing a person who is no longer here? 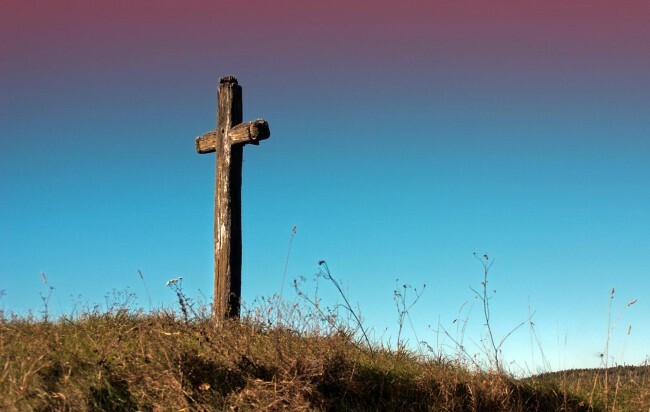 What does Jesus rising from the dead have to do with grief? Are we using Easter as a way to avoid talking about the difficulties of living in a world that still has death? Are we using the resurrection as a way to keep from talking about the pain of loss? Are we talking about the astonishment of Sunday to avoid the humanity of Friday? I believe that Jesus did rise. But there was a time when Jesus was dead. Let’s sit with those who are in that season. This entry was posted in Faith and Doubt, Grief and tagged death, Easter, faith, Good Friday, grief, holidays. Bookmark the permalink. One of the things I most love about this post is that you ask questions. Again and again. It moves the mind and heart into a more open space, a seeking space, a wondering and then, rather than you necessarily providing all the answers, answers, truth, can pour into ones own soul. Thanks for this. We cannot imagine the grief and loss that disciples must have felt at the end of the day Jesus died. Their hopes, dreams and faith were dashed. They could not have grasped what had transpired as anything but a horrible mistake. But the hope of Easter is that the place of pain and sorrow is also the birthplace of resurrection and life. While our circumstances metaphorically force us to sit on the other side of ‘Easter’, we must realize that we cannot fully grasp what may yet be only a sunrise away.